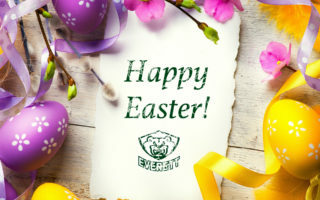 EVERETT – Remi Laurencelle scored twice as the Everett Silvertips opened Game 1 of their second-round playoff series with three unanswered goals that propelled the team to a 5-3 victory over the Portland Winterhawks Friday night at XFINITY Arena. The ‘Tips now carry a 1-0 series lead over the ‘Hawks into Game 2 Saturday night in Everett. With two goals on the night, Remi Laurencelle was awarded first star of the game. Defenseman Cole MacDonald tallied three assists and Ivan Nikolishin picked up two. Kohl Bauml and Jake Mykitiuk scored goals for Everett, while Patrick Bajkov notched a goal and an assist. The Silvertips outshot 24-11 over the final two periods, but built a 5-1 third-period lead before Portland scored two late goals to get back in the contest. The Silvertips came out strong in the first, producing the first goal of the game early in the frame. Ivan Nikolishin fed the puck from behind the net in front to Kohl Bauml, who fired it to the top corner to give the ‘Tips a 1-0 lead. Everett continued to produce scoring chances as Nikolishin hit the post at the side of the net. Minutes later, Remi Laurencelle made it 2-0 when Lucas Skrumeda stole the puck in the Portland zone and fed him in front, were he tucked a backhander under the pads of goaltender Adin Hill. The ‘Tips couldn’t find their third goal on the man-advantage later, but ended the period up 2-0 with Everett holding a 10-6 edge on the shot clock. Picking up where they left off, the Silvertips made it 3-0 in the early minutes of the second period. Remi Laurencelle tipped in a shot from Cole MacDonald for his second goal of the night and extended the ‘Tips lead to three. Everett killed off their first penalty of the game midway through the game as they outshot the Hawks by a 14-8 margin. Portland picked up the pace in the second half and forced Everett goaltender Carter Hart to make numerous key saves as they took over the lead on the shot clock. The ‘Hawks finally got on the board on a Miles Koules goal with 22 seconds left in the period to make it a 3-1 game. 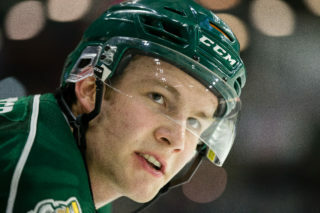 After what could have been a momentum-changing goal, Jake Mykitiuk tipped in another Cole MacDonald shot with 2.2 seconds left in the frame to restore the Silvertips three-goal lead. It was the Hawks that came out firing in the third, but Portland took a penalty that allowed Everett to regain control of the puck. 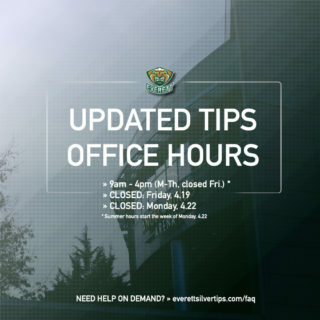 The Silvertips capitalized on the opportunity when Patrick Bajkov walked in from the far circle and snapped a low shot past Hill to make it 5-1 for the ‘Tips. Dominic Turgeon scored during 4-on-4 action to pull the ‘Hawks within three and then Alex Schoenborn banked a shot off the back of Carter Hart and in to make it 5-3 with 3:38 to play. With two minutes left in the third the Winterhawks pulled their goalie for an extra attacker, but the Silvertips shut the door to open the series with a 5-3 victory. Carter Hart (5-2) stopped 27 of 30 shots in net for Everett. Winterhawks goaltender Adin Hill (4-3) made 16 saves as the final shots were 30-21 for Portland. 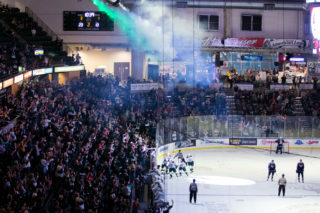 The Silvertips’ powerplay went 1-for-2, while the penalty killing unit denied Portland on their only attempt. 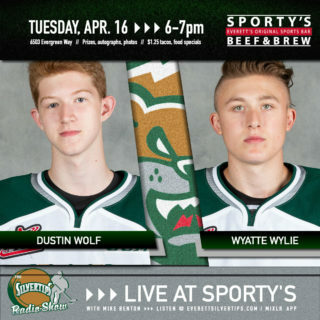 The series continues Saturday night at XFINITY Arena with Game 2 as the Silvertips look to take a 2-0 lead in the best-of-seven series before heading to Portland for the next two games. Opening puck drop is set for 7:05 pm.